Expression of p22phox-dependent NADPH oxidases in human lungs obtained from chronic obstructive pulmonary disease (COPD) patients who underwent lung transplantation. a) Quantitative real-time PCR for i) p22phox, ii) nox2 and iii) nox4 from homogenised human lungs (healthy controls n=8 and lungs obtained from COPD patients n=31). b) Compartment-specific analysis of p22phox expression in pulmonary arteries via laser capture microdissection by quantitative real-time PCR (n=6 in each group). ΔCT: CTavg (reference gene) - CTavg (target gene). CT: threshold cycle. *: p=0.05; **: p<0.01; ***: p<0.001. Correlation of p22phox levels with clinical parameters of chronic obstructive pulmonary disease (COPD) patients who underwent lung transplantation. p22phox correlation with a) mean pulmonary artery pressure (mPAP); b) oxygenation ratio (oxygen tension (PO2)/inspiratory oxygen fraction (FIO2)); and c) diffusing capacity of the lung for carbon monoxide (DLCO), the clinical indicator of lung parenchymal damage. ΔCT: CTavg (reference gene) - CTavg (target gene). CT: threshold cycle. p22phox is prerequisite for the sustained phase of hypoxic pulmonary vasoconstriction (HPV). a) An original recording illustrates the biphasic increase in mean pulmonary arterial pressure (ΔmPAP) in isolated perfused mouse lungs upon hypoxic ventilation (1% oxygen) showing acute (phase I) and sustained (phase II) HPV. Arrows indicate three different time points for flow-induced pressure changes (P–Q) during the normoxic baseline, HPV phase I and HPV phase II. b) Group data showing HPV response, determined as ΔmPAP, indicate reduced sustained HPV in p22phox-/- mice. Bar graphs showing no change in c) basal mPAP or d) body weight in p22phox-/- mice. n=6 for p22phox+/+ and n=8 for p22phox-/-. WT: wild-type; KO: knockout. *: p<0.05. 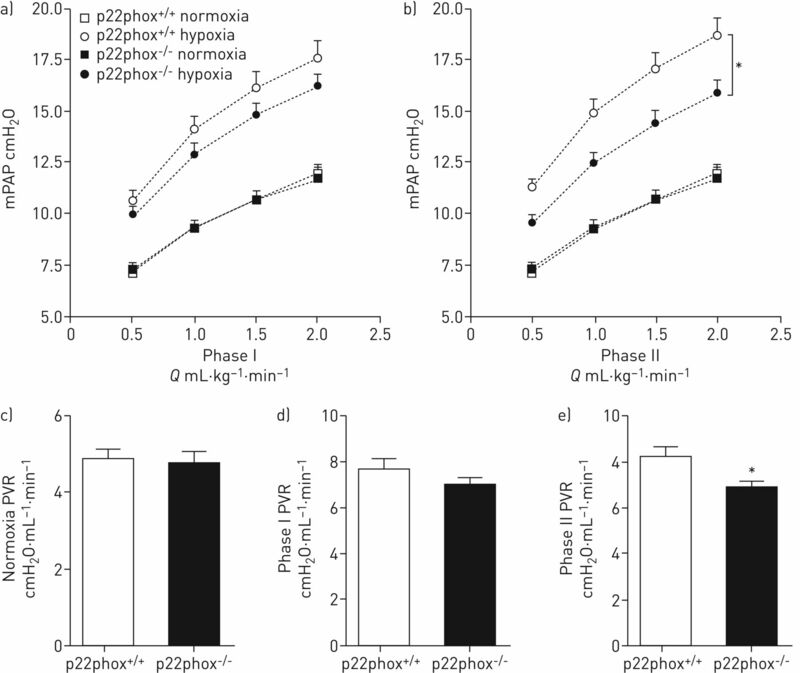 p22phox is required for increased vascular resistance denoted as P–Q under the sustained phase of hypoxia. P–Q curves obtained in isolated perfused lungs under a) normoxia, or phase I hypoxic pulmonary vasoconstriction (HPV); or b) normoxia or phase II HPV. Changes in pulmonary vascular resistance (PVR) under c) normoxia; d) hypoxia during phase I; or e) hypoxia during phase II derived from P–Q curves at the highest perfusion rate (2.0 mL·min−1). n=6 for p22phox+/+ and n=8 for p22phox-/-. mPAP: mean pulmonary arterial pressure. *: p<0.05. p22phox expression in the mouse lung. a), b) Immunostaining of p22phox in the p22phox+/+ mouse lungs. c) Absence of staining is shown in the lungs of p22phox-/- mice, along with d) negative control. Scale bars=50 µm. e) Expression pattern of p22phox-dependent NADPH oxidase isoforms and NADPH oxidase catalytic subunits in p22phox+/+ and p22phox-/- mouse lungs. n=6 for p22phox+/+ and n=5 for p22phox-/-. PA: pulmonary arteries; Br: bronchus; ΔCT: CTavg (reference gene) - CTavg (target gene). CT: threshold cycle. *: p<0.05. 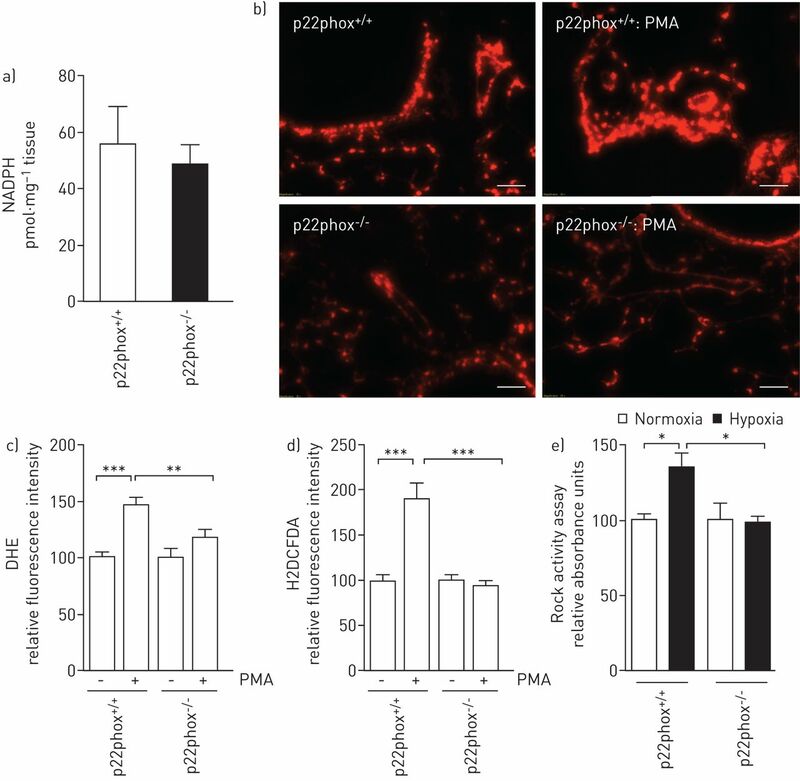 p22phox is required for functional NADPH oxidase/Rho kinase axis. a) Total NADPH did not show any differences in the lung homogenates levels in p22phox+/+ and p22phox-/- mice. b, c) p22phox deficiency abolished phorbol myristate acetate (PMA)-induced superoxide production and d) hydrogen peroxide in thin lung slices and single cell suspension of lung. Scale bar=50 µm. 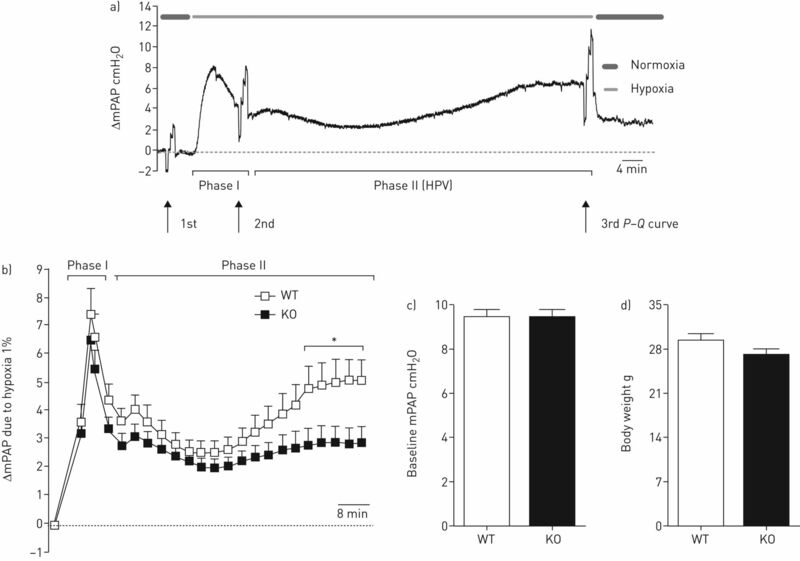 e) p22phox is required for hypoxia-induced Rho kinase (Rock) activation in lung homogenates. n=4–5 in each group. DHE: dihydroethidium. *: p<0.05. 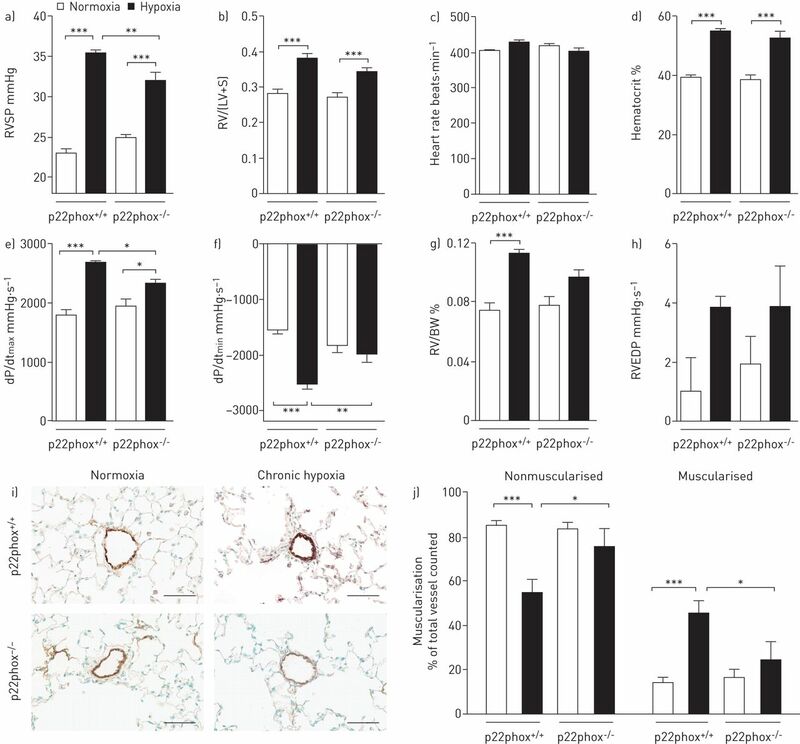 Lack of p22phox-/- attenuates pulmonary vascular remodelling under chronic hypoxia. Data showing the results obtained after 5 weeks of hypoxic treatment (10% oxygen) of p22phox+/+ and p22phox-/- mice. a) right ventricular systolic pressure (RVSP); b) right ventricular hypertrophy; c) heart rate; d) haematocrit levels. Detailed haemodynamic parameters are given as e) maximum rate of rise of RV pressure (dP/dtmax); f) minimum rate of rise of RV pressure (dP/dtmin); g) contractility index; and h) right ventricular end-diastolic pressure (RVEDP). i) Representative images for small pulmonary vessels of p22phox+/+ and p22phox-/- mice stained for von Willebrand factor (brown) and α-smooth-muscle actin (violet). Scale bar=60 µm. j) Degree of muscularisation of pulmonary vessels. BW: body weight. n=6–11 in each group. *: p<0.05; **: p<0.01; ***: p<0.001. Data are presented as median (interquartile range), unless otherwise stated. BMI: body mass index; FEV1: forced expiratory volume in 1 s; DLCO: diffusing capacity of the lung for carbon monoxide; mPAP: mean pulmonary arterial pressure; LTOT: long-term oxygen therapy; PO2: oxygen tension; PCO2: carbon dioxide tension; FIO2: inspiratory oxygen fraction; NA: not applicable. #: data are presented as median (range). mPAP: mean pulmonary arterial pressure; BMI: body mass index; DLCO: diffusing capacity of the lung for carbon monoxide; FEV1: forced expiratory volume in 1 s; LTOT: long-term oxygen therapy; PCO2: carbon dioxide tension; PO2: oxygen tension; FIO2: inspiratory oxygen fraction.